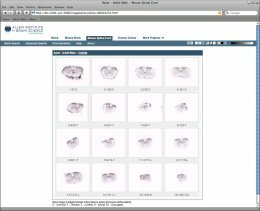 There are two ways to search the data on the "Spinal Cord " site; "Gene Search" and "Advanced Search." "Gene Search" appears on our landing page. A gene search will show you a list of all the experiments we've done involving a gene that matches your search criteria. A "Match" in gene search means that the text you type in is contained somewhere in the name, symbol or alternate symbol of the gene involved in the experiment. As you begin typing in the gene search box, a list of suggestions will appear. You can use your arrow keys or the mouse to move down, highlighting the desired entry. If you're using your mouse, click on the desired entry to select it, then hit your "Enter" key or click the Search button to perform the search. If you're using arrow keys, hit the "Enter" or "Tab" key to select the highlighted item. If you don't want to use any of the suggestions, hit your "Esc" key or click your mouse outside the list and it will disappear. Use the check boxes to limit a gene search to any combination of gene name, symbol or alternate symbols. Search by EntrezGene ID, or by our internal Image Series ID. Type-ahead suggestions will appear for the gene search and all of the ID entry fields. After selecting a suggestion, click the Search button or hit the Enter key to perform your search. As noted above, you can dismiss the list of suggestions by hitting the "Esc" key. The result set shows a collection of gene expression experiments. Please note-- If you searched by gene, it may appear that some of the rows do not match your gene criteria. Keep in mind that by default all of the alternate gene symbols (which are not shown in the result list) are included in a gene search. To see the alternate symbols for a gene, click on the gene symbol in the result list. If you want to exclude alternate symbols from your gene search, try the Advanced Search page. Each of our experiments is divided into 16 images, covering the length of the spinal cord. Each row in the result set contains a small expression chart that describes in which images expression was detected for the given gene. As shown in the example at left, each chart is divided into 16 bars, one for each image in the image series. If expression was detected in an image, its corresponding bar will be colored green. If no expression was detected, the bar will be colored white. If a section image is unavailable, its position will be colored black. The sections progress from rostral to caudal, reading left to right. This chart appears on the search results page and is meant to indicate membership in the various "expression enrichment" categories for each experiment. A dark blue rectangle indicates membership in the corresponding category. The category positions are described below; you can also hover your mouse over a blue rectangle to show the category name. The results are initially sorted by Gene Symbol in ascending order. Click on any of the column headers to sort by that column; click on the same column header again to reverse the sort order. A small arrow will appear next to the currently sorted column, indicating the sort order, as shown in the image at right. It is also possible to sort by expression position. In the expression chart illustration above, note the rectangular green blocks in the top row. Clicking one of these boxes will sort the results according to amount of expression in the corresponding area of the specimen. Each of the sort-boxes represents an area covering four images in the specimen. The first box (labeled "R" for Rostral) represents the four most-rostral images; the last box (labeled "C" for caudal) represents the four most-caudal images, and so on. The Gene Symbol links to detailed information about the gene in our experiments. The number in the "Images" column links directly to a contact sheet of all the images for the given experiment. In addition to the links found in each experiment row, you can select multiple rows to compare side-by-side. Click the check box at the far left of the desired rows, then click the "Compare Selected Experiments" button. Use the check box in the column header to toggle all of the row check boxes on or off. As shown in the image above, at the bottom of the table there is a link to an XML document containing all of the data in the result set. This section shows some gene metadata, including any alternate names for the given gene. 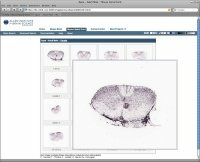 If we have data on the same gene in the Allen Brain Atlas project, a link will be included here. If there is a homologue for the current gene in humans and we have data on it in the Human Cortex project of the Allen Institute, a link will be included in this section. The colored bars in the Expression Info area are a more detailed version of the expression chart from the search result page, as described above. As in the smaller version of the chart, bars are colored green where expression was detected in the corresponding image and white where expression was not detected. There will always be 16 bars in the chart; in cases where an image is not available, the bar will be colored black. 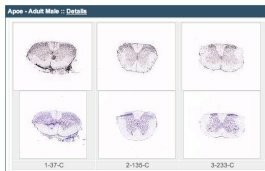 In this detailed view, each bar in the chart is labeled with the image index, tissue index, & annotated segment abbreviation (if available.) The image index refers to the position of the image relative to the image series; these will range from 1 to 16. 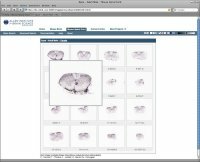 The tissue index refers to the position of the section relative to the specimen as a whole. 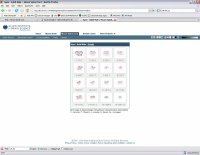 The External Resources section contains links to other organizations that provide gene expression data. These links open in a new browser window, and should show information related to the current gene. The image detail page displays the ISH images from one or more image series. A number of different display and formatting options are described below. Use the layout buttons located on the page toolbar to switch between the various layout options. The default layout shows one or more zoom-and-pan (zap) viewers. 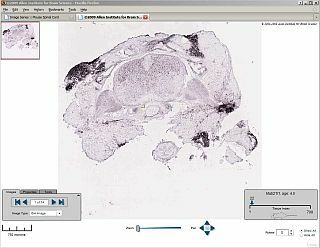 The zap viewer allows you to navigate through an image series' thumbnails to select an image to view at higher resolution. Once selected, you can use your mouse or keyboard to zoom and pan the larger image. Additional image manipulation tools are described below. Select a thumbnail from the bottom of the image series' window to open its image in the viewer window. Drag the image with your mouse pointer to an area of interest, then use the plus (+) and minus (-) keys or the wheel on your mouse to zoom in and out. Move the slider bar to the left to intensify the contrast or color. Select ISH, Nissl or expression mask image type. 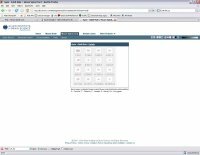 Open the selected image in a high-resolution viewer in a new browser window. Synchronize the images in other viewers on the page to the currently selected image. 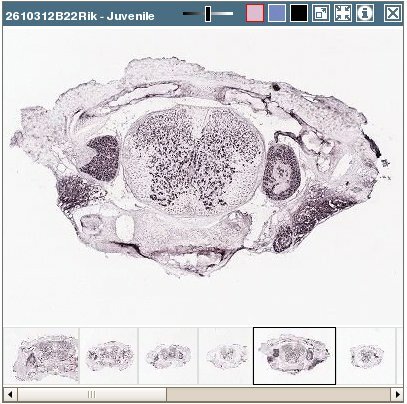 Only images from specimens of the same age will be synchronized. 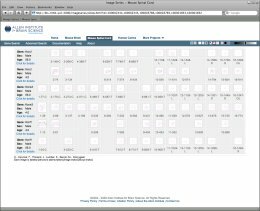 Open a new browser window to review metadata for the image series. Multiple image series can be opened on the same Web page to enable side-by-side comparisons. You can swap viewers' positions on the page by clicking on the first viewer's title bar and dragging it to the second viewer's position. The layout buttons on the image control toolbar can be used to switch between the contact sheet & row-based views. The contact sheet layout for a single image series looks like the image to the left. 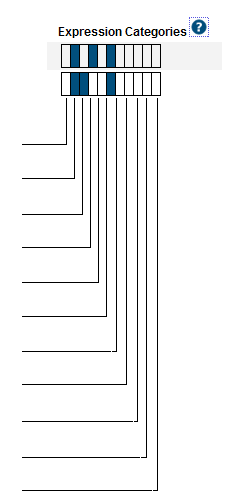 Images are arranged in four rows of four. This view is probably most useful for a single image series. Multiple image series will be shown in a row-based layout, as shown at right. This view allows all the images from a large number of image series to be visible at one time. The sizing buttons on the toolbar can be used to change the size of the thumbnails. By default, the largest thumbnail size is used when viewing a single image series. When multiple series are compared, a smaller thumbnail size will be used. You can override these default values by using the image sizing buttons on the toolbar. As you move your mouse over each thumbnail, a magnified version of the image will pop up. Use the magnifier buttons to set the size of the magnified image, or disable the magnifier. The currently selected magnifier button will be highlighted with a red border. To the right are examples of the small & large magnifiers in use. Clicking on any of the thumbnails will launch a high resolution viewer for that image in a new browser window. See the Single Image Viewer section below for details on working in that view. The enhanced expression mask. This image is constructed from the signal detected by our image analysis algorithms. This is a grayscale image where the lighter areas indicate stronger signal. Due to the generally low signal, we are showing by default an enhanced version of the expression mask. The bright points in the image have been enlarged and brightened further to make expression more easily discernable in the small thumbnail images presented here. NOTE that clicking on the expression mask thumbnails will open the image in a high resolution image viewer. The expression mask image is not enhanced in the high resolution viewer. The closest Nissl stained section. Every tenth section is Nissl stained. Clicking on the black button in the "associated image" toolbar group ( ) will swap out the ISH image and swap in the expression mask image. To return to the ISH image, click on the ISH ( ) button. Clicking on the "nearest Nissl" button ( ) will toggle the display of the nearest Nissl image for each thumbnail. The Nissl image will be displayed beneath its corresponding thumbnail, as shown at left. The nearest Nissl image is available whether the ISH or expression mask thumbnail is currently being shown. Use the slider control on the toolbar to increase or decrease the contrast and brightness of the thumbnails. Changing this setting will affect both ISH & expression mask thumbnails, but not Nissl images. The center position is "neutral," that is, no enhancement is applied to the images. Moving the slider to the left will darken the images, moving to the right of center will brighten them. To reset the slider to its default position for the type of image currently being displayed, click on the corresponding Image Type button. The default position for ISH images is "neutral", while the default position for expression mask images is about +80% brightness. Click on any thumbnail image in this application to launch the high resolution viewer in a new browser window. This viewer provides an efficient way of viewing very large, high resolution images over relatively low bandwidth. Use the controls shown at left to zoom and pan around the image. You can also zoom by clicking on the image, and pan by click-and-dragging the image, or using the keyboard up/down/right/left arrow keys. Switch between an ISH image and its corresponding expression mask or closest Nissl image. Page through all the images in the same image series. The scale key will change appropriately as you zoom in and out of the image. Click and drag the key to any position on the image to measure regions of interest. Click on the text to flip the scale from horizontal to vertical. The position key shows approximately where the current section comes from, relative to the specimen as a whole. The rotate control allows you to rotate the image to manipulate viewing orientation. Please note that if you download a JPEG of the image (see tool box description above), the image will not have any rotation applied to it; it will have a rotation of 0 degrees. Click here to go to the expression mask color map page.